So in the latest September update, these three spells were completely redone and reworked to make them even better than before! I’m here to tell you exactly how they have changed and how to use them more effectively! The Lightning spell got totally sidelined after the July update when the new Poison and Earthquake spells made better alternatives to the lightning spells typical duties. 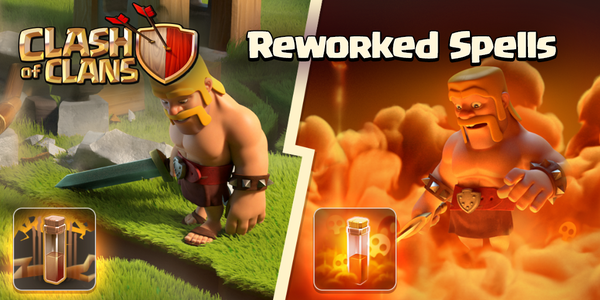 Clash of Clans saw this and realized they needed to change the Lightning spell to bring it back! So the changes to the Lightning spell include the level 7 upgrade. Along with the level 7 spell, made the level 5 and level 6 have increased damage. The biggest change however was that lightning spell bolts strike closer together making it a lot more precise so you don’t miss your target anymore! The Poison spell was added back in the July update and completely changed the way to kill Clan Castle troops. However, you could only use it to kill lower health units such as wizards and archers. You couldn’t take out dragons so EVERYONE started using drags in their CC. Understanding these changes, Clash changed it up! The Poison spell now works similar to an Inferno Tower, starting off slow, and then heating up to cook the troops fast at the end. It has a huge amount of damage and can almost take out a dragon now. It also reduces the attack rate of the defending troops. The Earthquake spell was the 2nd dark spell and really didn’t seem that good at the beginning since it took a percent of the health of the building away. It took 4x damage away from walls, so every player was using it as a giant wall breaker in a sense. The Earthquake spell wasn’t really intended for this purpose, so now it deals much more damage. The first Earthquake spell will take away 25% of the health of any building in the diameter. It then goes down from there, but it makes it much easier to kill buildings. ← Town Hall 11 in the ClashCon October 2015 Update?